First, we urge you to take the time to read the “Basics” and “Technology” sections at the front of this catalog. Air conditioning is not difficult to install, but it is a system with components which must be carefully selected and matched to perform to its maximum potential. Our Authorized Distributors have the knowledge to assist you in finalizing your order, or feel free to call us directly with any technical questions you may have. Turn to the order form on Page 97 of this catalog. It has been designed to help you assemble the specifications of your vehicle, engine type, and other details necessary to order properly. Having this information assembled before you call to order helps our dealer get you the right components for your vehicle. 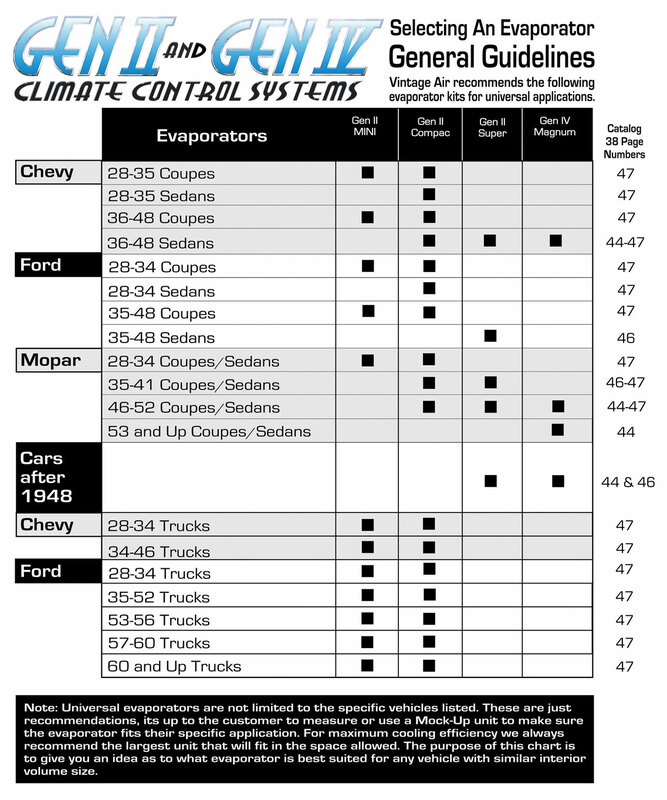 Based on the specifications for your vehicle, you can probably determine which evaporator is best suited to your car. Just note the series number printed directly under the unit photo. Then specify “Heat & Cool” or “Heat, Cool & Defrost” model. (Example: Page 46 shows our GEN II Super Cooler, series number 61005.) That number provides a starting point to building your system package. Remember, always select the largest possible evaporator unit for best results. Decide which type of standard or optional ProLine controls you want (See Page 48 for Gen II, or 45 for Gen IV). Note your selection by name and number. Decide which type of louvers you want. Choose from the standard louvers on page 53, or upgrade to ProLine louvers shown on page 56. Note by name and number. Note any additional custom features, optional ProLine accessories, and other items such as engine cooling fan, fan shroud, compressor safety switch (binary or trinary), etc. (Your compressor mounting brackets will be determined by your engine specs.) Other upgrade brackets are available on Pages 65-69. Go to our website and find your closest Authorized Distributor from our worldwide listings, or call us at 1-800-862-6658 today for more information. Pick up your phone and start “Living The Cool Life” with your new Vintage Air system!